You can't see our New York City office right now, but it's something of a laptop menagerie. We just finished reviewing a laptop whose screen flips inside its hinge, and now we're testing an Ultrabook with a touchscreen, along with a notebook whose screen folds all the way back. The Toshiba Satellite U925t ($1,150) is yet another breed of Windows 8 hardware. It's a slider, to be exact, which is to say its 12.5-inch screen slides out and up to reveal a full-sized keyboard. It's nice, in theory, because you can use it as a tablet without having to worry about packing a separate keyboard. But unlike the Dell XPS 12 or Lenovo IdeaPad Yoga 13, which can also be used in tablet mode, the screen here is always exposed. As you can imagine, too, that propped-up display has a very real effect on the typing experience. Given all that, is there any reason to consider this over other, similarly priced Windows 8 convertibles? Could there perhaps be any performance benefits, or advantages in screen quality? Meet us after the break where we'll hash it out. The U925t's slider form factor makes for a compromised typing experience. 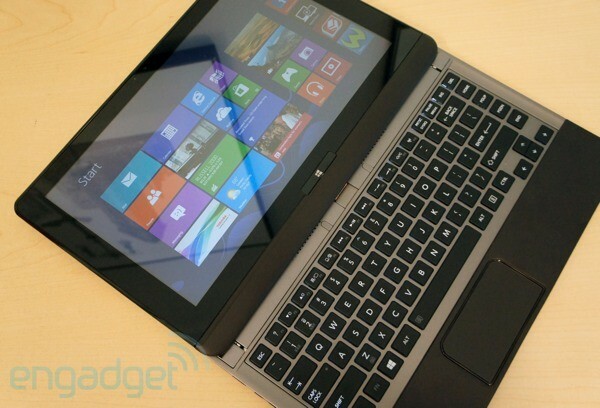 Meanwhile, other Win 8 convertibles offer better screens, battery life and build quality for a similar price. Be the first to review the Satellite U925t? It's as if Toshiba gave up midway through the design process. 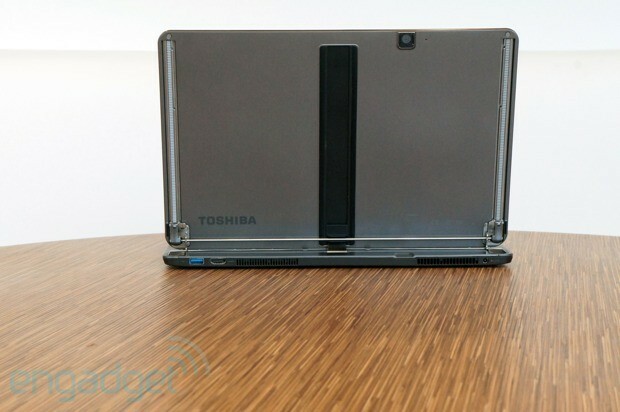 Back in June, if you recall, Toshiba announced an Ultrabook called the Satellite U845W. You might remember it as that funky-looking notebook with a 14.4-inch, 21:9 display, but we think of it a bit differently. To us, it's simply the prettiest, most understated PC Toshiba has put out in a long, long time. It was the mix of materials that sealed the deal: a machined aluminum lid, soft-touch accents, a backlit keyboard and even a metal FCC plate. It was tactile, inviting and, most importantly, subtle. The U925t isn't an exact copy (it doesn't even have a lid) but it does borrow some key design elements. This, too, has a textured, rubbery finish both on the underside and on the palm rest. As on the U845W, Toshiba went with an inoffensive shade of dark brown. These are also the same flat, chiclet-style keys, just shrunken down to fit a smaller deck. That said, this seems to be a clear step down in build quality. The whole thing is made of plastic, and while the soft-touch materials do a good job masking that, you can still feel it in the keyboard panel, which exhibits some noticeable flex. Also, Toshiba didn't give much thought to how the back of the device looks once you slide out the display and prop it up. That backside has a bare, almost unfinished look -- it's as if Toshiba gave up midway through the design process. On another machine it might pass for industrial; here, it just doesn't match the rest of the design. As for that display, it's coated in scratch-resistant Gorilla Glass, which is a fortunate thing since the screen is constantly exposed (unless you buy a sleeve for it, of course). We didn't really consider this when we first got hands-on: at the time, we were more concerned with how sturdy the sliding mechanism was (pretty sturdy) or how comfortable the typing experience would be (just okay). It's once you find yourself in possession of an $1,150 machine that you start to feel a bit nervous about sticking it in a bag with other items. As we've found on phones, tablets and other devices, though, the Gorilla Glass does a good job of keeping the screen pristine. So after spending a little time with it, we were able to relax and trust the panel wouldn't get ruined. One nice thing about this form factor is that you can set it in your lap with the display propped-up and not have to worry about the whole thing toppling backward. The hinge on the backside anchors the display in such a way that you needn't worry about the weight distribution, as you might with a dockable tablet. Of course, too, that slider form factor means you can use the U925t as a tablet when you want to. As we said with the XPS 12, though, you wouldn't want to use a 3.35-pound, 12-inch tablet for long periods of time. Your arms would get tired. If you're hanging out on the couch, however, and can rest the PC against your legs, it makes for a nice lean-back sort of device. At 3.35 pounds, the U925t is naturally a bit heavier than 12-inch machines that don't have a touchscreen, but it's the exact same weight as the XPS 12, which can also be used as a tablet. Size-wise, the chassis measures 0.78 inch thick, which is just wide enough to accommodate an HDMI socket and two USB 3.0 ports, one of which supports Toshiba's Sleep and Charge technology. Poke around further and you'll find a volume rocker, a key for enabling screen auto-rotation, the power button, a volume rocker and two vents around back. There's even an SD card reader, something you won't find on the Dell XPS 12 Windows 8 convertible. Finally, being a PC you can use as a tablet, this has not one, but two cameras: an HD webcam up front, and a 3-megapixel, autofocusing shooter on the back. On the inside, it supports Intel Wireless Display, like so many Ultrabooks, but it also packs an NFC radio, which is still something of a novelty on laptops. We're grading on a curve here. When we first got hands-on with the U925t, we said it had a roomier keyboard than most sliders we've seen. And that's true; an inherent problem with this form factor is that when the display is propped up, the hinge 'round back eats into the usable deck space, leaving the keyboard area unusually cramped. We still say the U925t has a better keyboard than the new MSI Slider S20, but that isn't saying much. The layout here still feels crowded compared to the XPS 12, or any other ultraportable with a fully usable keyboard deck. 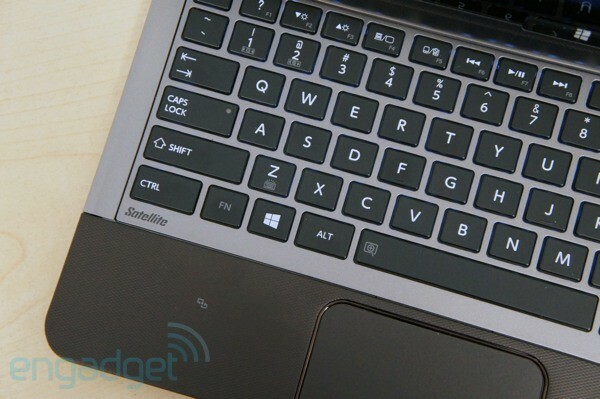 If you thought the keyboard was crowded, imagine how squat the touchpad is. To its credit, it's wide; it's just not very tall. That's mainly an issue when you're trying to click the built-in touch button (which you might resort to if you're in File Explorer or some other desktop app where precision is needed). In that scenario, it's tough to fit both your thumb and index finger on the trackpad at the same time; your index finger might well brush up against the top of the touchpad, and hit the spacebar. Fortunately, the touchpad is big enough so that you can comfortably do two-finger scrolling, which works smoothly on this device. You probably won't need the touchpad for pinch-to-zoom because, you know, you can just reach up and use the touchscreen for that. In addition to Gorilla Glass protection, the 12.5-inch display offers some good viewing angles, thanks to in-plane switching (IPS) technology. Given that this isn't the sort of machine you're likely to crowd around with friends, you might appreciate the viewing angles most when using the PC in your lap. Using it that way, we had plenty of leeway when adjusting the screen. As for the 1,366 x 768 resolution, that's quite standard among Windows machines, especially models with small screens. It's perfectly adequate for watching movies and getting work done, but it's worth noting that there's a growing number of 1080p offerings out there, including the Dell XPS 12 and the Acer Aspire S7, a 13-inch Ultrabook with a touchscreen. Indeed, we happen to have both of these other machines lying around, and as you'd expect, their screens look crisper, and the difference is noticeable in both the desktop and in Microsoft's Modern UI. The U925t's two speakers are located on the bottom side of the device, just underneath the palm rest. As you might expect, given the size of the laptop and also the location of the speakers, the sound never gets very loud, even at max settings. Like so many other laptops, too, the sound is decidedly tinny, with clipped bass notes. Those low tones sound especially distorted at top volume, so you might want to keep the volume at a more moderate setting, even if it means making do with a more subdued audio experience. This might be the most straightforward performance comparisons we've ever published. Each of the Ultrabooks listed in that table up there runs Windows 8, and three of them have the same Ivy Bridge Core i5 processor. All have Intel's latest integrated graphics solution, the HD 4000 chipset. Appropriately, then, benchmark scores in PCMark 7, 3DMark06 and 3DMark11 are all on par with one another. The one exception is the Acer Aspire S7, which we tested with a Core i7 CPU and RAID 0 SSD setup. So, there aren't many indications that the U925t is either faster or slower than its competitors. Its max disk speeds, as measured by ATTO, were very close to what we got with the XPS 12. Its read speeds are considerably faster than the Yoga 13's (521 MB/s versus 278 MB/s), but that seems to say more about the Yoga, since the XPS 12 also notched read speeds in the 500 MB/s range. In real-world use, the U925t boots up quickly: eight seconds to the log-in screen, and then another two seconds to load the Start screen. That's even faster than the XPS 12, which took 12 seconds to boot. We did notice that certain Windows 8 apps such as the Windows Store were slow to load, but we didn't notice any lag as we toggled through open apps and browser tabs. If anything, the biggest red flag was fan noise: the machine gets awfully loud, particularly while running games. At one point, the sound coming from the fans was so loud that we worried we were annoying other people in the office. That's a subjective measure, of course. So here's a more practical question: will that fan noise annoy you while you're trying to concentrate? When it comes to testing battery life on Windos 8 laptops, we're in the middle of a disappointing streak: the U925t lasted little more than five hours in our standard rundown test, which involves looping video with WiFi on and the brightness fixed at 65 percent. As taxing as that test is, we've seen some non-touch-enabled Ivy Bridge Ultrabooks last upwards of six hours, if not seven. And yet, the best showing we've seen so far from a touchscreen Windows 8 Ultrabook is the Lenovo Yoga Ideapad 13, which lasted five hours and 32 minutes in the same test. (Full review coming soon, promise!) Likewise, the Dell XPS 12 lasted five hours and 30 minutes. By those standards, the U925t's battery life isn't surprising, per se, but it still isn't great. Compared to some other PC makers, Toshiba included quite a bit of bloatware, including: Netflix, eBay, Amazon, Vimeo, Encyclopedia Brittanica, the Merriam-Webster dictionary, iHeartRadio, iCookbook, Origin (EA's game store) and a 30-day trial of Norton Internet Security 2013. Toshiba also threw in some items of its own, including Book Place, News Place and a support guide. Fortunately, at least, crapware in Windows 8 takes the form of an extra cluster of Live Tiles on the Start Menu; none of this will litter the desktop. Annoyingly, some of these programs come pinned to the Taskbar, but you can of course un-pin them if you so choose. Like most consumer laptops, the U925t comes with a one-year parts-and-labor warranty. The battery also has one year of coverage. With so many other Windows 8 convertibles available or arriving soon, we suspect your money would be better spent elsewhere. The U925t is sold in one configuration on Toshiba's site: the same $1,150 model we tested with the Core i5-3317U processor, 128GB SSD and 4GB of RAM. Those are fairly typical specs, as far as Ultrabooks go, though some power users might lament that they can't configure it with a Core i7 CPU, 8GB of RAM or 256 gigs of storage. 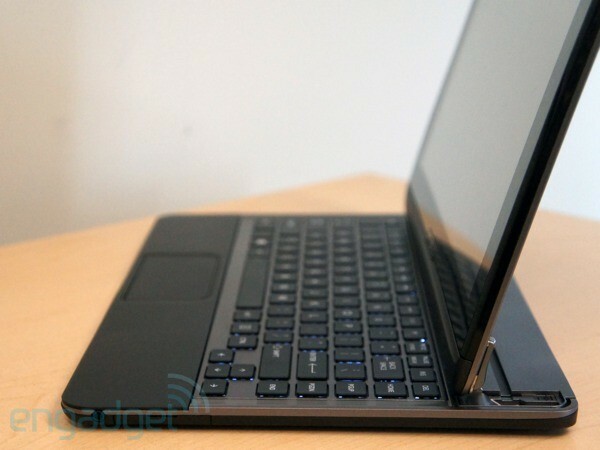 We've already mentioned the U925t's most similar competitors: the Dell XPS 12 and the Lenovo IdeaPad Yoga 13. Why do we choose these? Well, we were looking for Ultrabooks that could be used as tablets -- specifically, Ultrabooks with 12- or 13-inch screens. Anything bigger would mean making some serious compromises in mobility. For the purposes of keeping things brief, we also won't dwell on regular old touchscreen notebooks, because you can't really use those as tablets, even if you are tapping the display with your finger. So, that leaves us with a fairly small group of machines, with the XPS 12 and Yoga 13 being the most prominent. If you can get past the XPS 12's odd form factor (that's the one whose screen flips inside the hinge) it's actually a solid little touchscreen Ultrabook. At $1,200 and up, it costs about the same as the U925t, and comes with nearly the same specs, including 4GB of RAM, a 128GB SSD and that Core i5-3317U processor. The big difference is the display: the XPS 12 comes standard with a 1080p IPS panel and yes, it is as lovely as it sounds. The XPS 12 offers nearly identical battery life to the U925t and weighs the same. 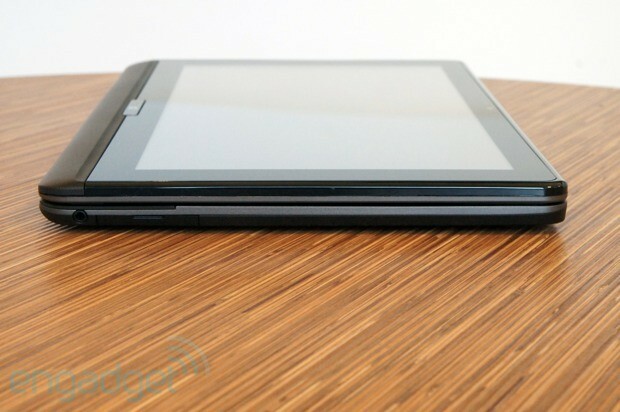 It can also be configured with 8GB of RAM and a 256GB SSD. Its design and build quality are excellent too, but there is one catch: it's missing an SD reader. As for the Yoga 13, we need to tell you up front that we're still testing it, and aren't ready to weigh in decisively. That said, we're enjoying its comfortable keyboard and solid build quality. As you can see in the above performance tables, its battery life is slightly better than the U925t's, and on par with the XPS 12's. The performance across these three machines seems to be comparable. As for specs, it currently starts at $1,000 with a Core i3 processor, 4GB of RAM, a 128GB SSD and a 1,600 x 900 display. To get the same Core i5 CPU offered in the U925t and XPS 12 you'd have to pay $1,100, which is still slightly less expensive than the Toshiba model. If Toshiba got one thing right with its first Windows 8 flagship, it's this: there is indeed a market for PCs that can be used as tablets. It's convenient to tuck your Ultrabook's keyboard away when the moment strikes, and turn it into a slate (a big, heavy slate, but a slate nonetheless). That's a nice option to have when you're hanging out on the couch, half-watching TV: you might want to glance at your email or look up actors on IMDb, but you probably aren't going to make much use of the keyboard. Not when you're acting like a couch potato, anyway. The more we use the Satellite U925t, though, the more we're convinced Toshiba took a gamble on the wrong form factor. That propped-up display eats into the available deck space, making for a compromised typing experience. The trackpad, too, is unnecessarily small, which might bother folks who are trying to get work done on the desktop and can't really get by on finger input. Meanwhile, the Dell XPS 12 and Lenovo IdeaPad Yoga 13 cost about the same and weigh about the same, except they approach that tablet transformation in such a way that you never lose out on keyboard space. There are other issues with the U925t, too. Battery life is shorter than on those two competing models we mentioned, and the build quality isn't as robust. What's more, the XPS 12 comes standard with a 1080p screen, while the Yoga 13 has a 1,600 x 900 panel. The display would have been one of the few saving graces for the U925t, but it has a lower resolution (1,366 x 768). And while the viewing angles are good, they're no better than what other machines are offering. That's not to say the U925t has no redeeming qualities in its own right, but with so many other Windows 8 convertibles available or arriving soon, we suspect your money would be better spent elsewhere.